Integrated computing platforms enable IT to focus on more valuable tasks that will speed time-to-market and improve application deployment and availability to better support the business. HP ConvergedSystem 700x with VMware vSphere is a flexible preconfigured solution designed for small to large enterprise and service provider deployments. Built on HP ProLiant or HP BladeSystem servers, HP StoreServ storage, and HP 5900-Series and HP Flex10 networking. HP ConvergedSystem 700x with VMware vSphere solutions are designed to address virtualization complexity, expedite virtualization deployments, and serve as the foundation for private cloud implementations. 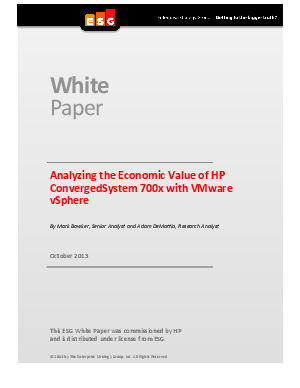 Read this whitepaper to learn more about ESG’s analysis of the costs and benefits—and ultimate economic value—associated with deploying and managing HP ConvergedSystem 700x with VMware vSphere versus a comparable conventional data center infrastructure comprised of discrete, nonintegrated compute, storage, network, and management components.